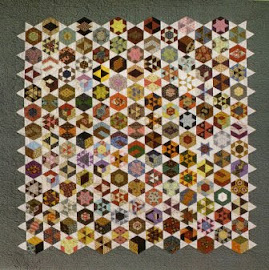 PENNYLANE PATCHWORK: This goes with that! As my Vintage Wheels BOM is nearing an end I have decided to take on two new BOM's by Sue Daly. The first is her 'This goes with that' and the Fussy-cut Club. The postie delivered the packs yesterday and last night I made my first two hexagons! Over the course of the program you will also receive 8 acrylic templates. In the first month you recieve a gorgeous pink project organiser and in month four you recieve a pattern for a Tulip bag. Month One - my model is holding the needles and thread! I have so many beautiful reproduction fabrics to share with participants. Stripes which are my favorites will make great secondary designs in the blocks. The cost will be $38 a month plus postage so email me (Click on email me) if you want to join in!